Exhibited in galleries around the world, the haunting and poetic images of the Seeing with Photography Collective are created in a dynamic process called “light painting” transporting the viewer into their unique dream world of surreal portraits. 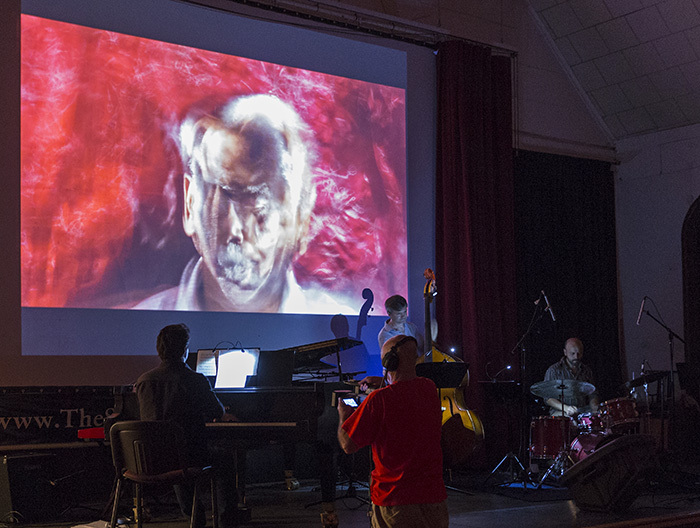 Their captivating images will be projected on a video screen throughout the performance. Audiences will hear recorded interviews from these blind & visually impaired photographers reflecting upon their personal experiences with blindness and Daniel Kelly’s riveting original music composed in response to these compelling stories. Audience members will create a new photo with members of the Collective that will be projected on screen during the concert! A SELECTION OF UP TO 20 PHOTOGRAPHS CAN BE MOUNTED IN THEATER LOBBIES FOR AUDIENCES TO VIEW. 8X11 PRINTS OF SELECT PHOTOGRAPHS WILL BE AVAILABLE FOR PURCHASE AT PERFORMANCES. To learn more about the Seeing with Photography Collective watch this trailer about BlindSight, a short documentary film that examines the photographic imagination of the members of the Seeing With Photography Collective in New York City. While all the members were sighted at one time, they are all now blind or visually impaired. Many came to photography after their loss of sight, and photography has given them a new voice, a way to express what they feel, what they see inside their head. The results are transformative, for the members and for the viewer. They are tangible proof of how creativity enhances life and gives power.